I have to admit: I usually don’t get excited about soup, unless it’s Ramen. For soup to impress me, it has to be very filling and flavorful, and I give bonus points if it’s easy to make. Since it’s chilly outside (and since I needed to use two potatoes before they grow a bunch of weird potato-cysts), I decided to give soup a chance today. Peel the potatoes and cut into bite-size pieces. If you’re using a regular sized carrot, chop it. No prep is required for baby carrots. In a large pot, bring water, potatoes, and lentils to a boil. Heat medium-high for about 15 minutes, until potatoes are soft enough to stick a fork in. Around minute 10, add in the carrots. Drain and blend with remaining ingredients until smooth. Add more soy milk if it’s too thick. Donate to Vegan Outreach. Not required, but definitely recommended. While the potato mix is blending, heat oil on medium in the same pot (less cleanup! ), add kale, and cook for a few minutes, stirring often. Add potato mixture to pot and mix together with the kale. 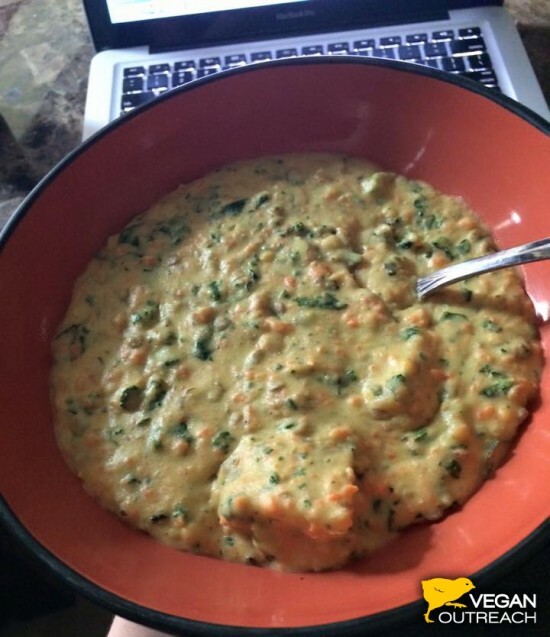 Serve in a bowl at the coffee table, so you can work while you eat! HAHA sneaking donation into the directions, that’s your impressive plug!? ..Oh, I actually fell for it. Made my soup taste that much better, too. Don’t skip that step, readers! I like to prep the lentils (if they are the dried kind) by pouring boiling water over them and allowing to sit for 15 or 20 minutes. I’m picky about my veggies staying al dente and this helps. Lisa – can you clarify if the 1/2 tsp is curry paste or curry powder? Looking forward to making this! Kayleigh, sorry for the delay in responding. I used curry powder. I’m updating the recipe now! Thank you for asking. Love the idea of donating to Vegan Outreach as one of the steps, as well as taking the meal at your work station. You know our busy lives, Lisa!